Yes you heard me right, this really is a thing. 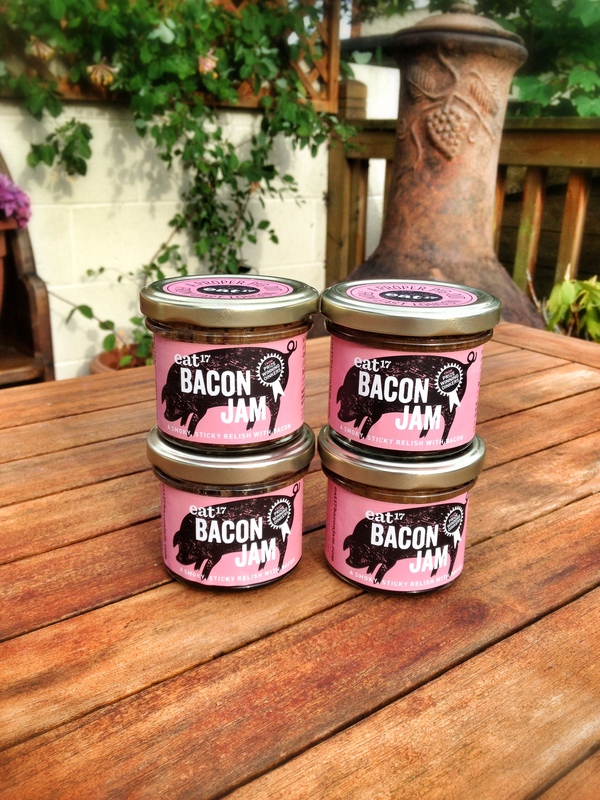 Praise the lord, our dreams have come true, bacon meets jam! I was working up in Soho a few weeks ago when someone came in saying that they had just had lunch at a pub in East London, and then he said it, ”I had a burger, it had Bacon Jam on it”. Say What?!!!! Ten minutes into my train journey home I had found it on google and ordered a batch from Amazon. Never had I been so excited about ordering something online. The creator James Heming made it for the burgers in the restaurant of ‘Eat 17′, but when the customers started asking for jars of it to take home he knew they were onto something special. It’s made using Denhay’s award-winning dry cured bacon and a technique similar to making jam and the results are, to use a term that’s being bandied around like crazy, AMAZEBALLS. I would say it’s more savoury than sweet, it even has a flavour similar to pork stuffing. So far I have added it to Pizza, toasties and sandwiches and just slathered it on chunks of cheese. I plan to put it on whatever I can, I’m thinking it would be really nice spread over pork chops and put straight into the oven. I recommend you buy it, now, this second. The longer you wait the longer it will take to bring this little jar of heaven into your world! There’s no need to head to East London either it will be delivered direct to your door. For those of you who like something a little hotter, they also do a chilli version! P.S Since writing this blog Bacon jam has been snapped up by Waitrose. Perfect, don’t have to wait for delivery any more! I’m definitely buying some, this sounds awesome! Time to go google!